For many people, video is a source of entertainment, but it can also be a form of media for a niche or a brand to attract new customers. For affiliates, this could mean more traffic numbers and sales conversion. Does this sound like something that you want? Great, because today, I’ll be showing you how to use YouTube for affiliate marketing to do just that. Firstly, it is easy to register for a YouTube account as long as you have a Google ID. Video hosting doesn’t cost a thing, so it’s basically a free marketing tool at one’s disposal. Videos on YouTube can be easily assessed anywhere across different devices, thus generating more audience and subscribers for a brand. This is often the first place where video marketing populates. The second place where a video often shows up is on Google search because 55% of keyword research will yield video results. That means, if you do good SEO, it’s relatively easy to rank on the first page. If a video is embedded on a website, it can potentially increase the time visitors spend on a particular page and this improves bounce rate and the overall ranking position. Likewise, with more viewing impression on YouTube, you will be able to influence more people to visit your site which will indirectly boost Google rankings too. Besides serving as a video platform, YouTube is also a social media site and that means, sharing content that are interesting and helpful can lead to a ripple effect of traffic volume. The benefits of using YouTube are obvious, but as far as making sales conversion is concerned, it’s important for affiliates to funnel visitors to their website and not just to their video channels. That’s because placing affiliate links on social media is somewhat controversial. Some say you can as long as they are relevant, but some say you aren’t allowed because YouTube and affiliate programs are quite strict about where these links are being published. The only thing that seems commonly acceptable is a website link hence, I would say that it’s much safer to lead viewers through a product review page that will naturally contain affiliate links. By following this route, it is less likely that you’ll violate any rules and regulations set by the platform or the merchants and thus, can continue to leverage from the power of video marketing for the long term. With that in mind, let’s see how we can use YouTube to convert our audience into potential customers. As mentioned earlier, videos are embeddable and that means, one can also place them on sites (granted, with permission) even when it is not their media property. This can be an option for those who don’t want or not ready to produce their own videos, but still wants to take advantage of YouTube. However, in order to be discovered within the platform, creating your own is still a necessary move. So, how exactly does one rank on YouTube, engage with the audience and turn them into buyers? Here are some simple steps to follow. If you think about videos just like another piece of content written in a blog, then it’s natural to start off with researching keywords because it provides insights as to what audience are thinking. This is basically a process of discovering trending search queries, analyzing those keywords and using them to target a specific audience to an online content, be it an article or a video. By using the technology of autosuggest, YouTube has a way of showing us what people are searching for on their platform. When a keyphrase is entered, the machine will suggest a few more terms that are relevant and you can toggle these words front and back in order to find more ideas. Similarly, on Google, this technique can also reveal interesting keywords that are taking place in the search bar. 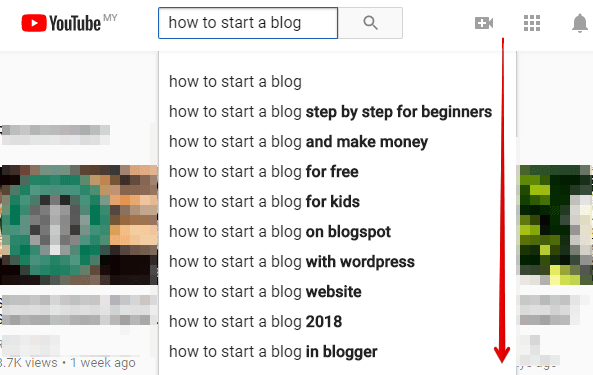 I use the same phrase ‘how to start a blog’ and the returned results have similar varieties to that of YouTube. This is the part where I meant by keywords that populates on YouTube will also do the same on Google because both search engines belongs to the same company. The importance of narrowing down these queries is to help you decide what type of video content to create. What’s the point of publishing something that people are not interested in knowing, right? So search popularity is the first metric a keyword must have. The second metric is called competition and this one tells us the level of difficulty it takes to rank for a particular keyword. For those who are new to video marketing, aiming for low competition keywords will improve the chances of your videos being discovered on YouTube. Since this metric cannot be discerned easily through the search engines, using a good keyword tool like Jaaxy would be helpful. The competition metric for this tool is called QSR and I would always aim for less than 100 as the standard score. 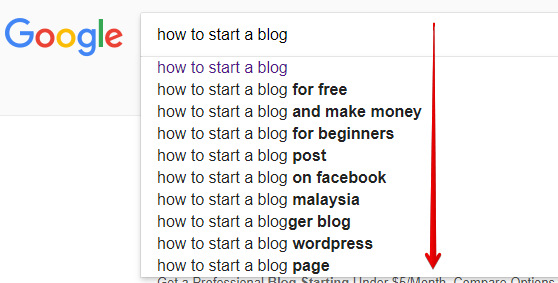 Therefore, if the keyword “how to start a blog” yields about 368 QSR, then this topic would be difficult to rank for. On the other hand, it may be easier to go with “how to start a blog with WordPress” because the QSR score is only 55. It’s still a relevant topic, but more targeted and less competitive. The same technique can be applied to any type of niche keywords, as long as they meet this criteria. With a targeted keyword in mind, the next step is to create a compelling and interesting YouTube video. Just like writing a blog, content matters when it comes to any type of online engagement. If the content is difficult to understand and irrelevant to the users, then the video will convert very poorly and not shared as frequently. Hence, before doing something big and shiny or even coming up with a persona, plan the content carefully and deliver it in such a way that benefits the long term viewers. I always find that simplicity gets the message across so think along that line when you are creating a video. In terms of hardware setup, I’ll let Sunny do the talking in the video below as it offers some really good tips for beginners. The process of ranking on any search engines is called optimization whereby keywords can be used strategically to attract more viewers. The first place to implement this is on the title because that’s what people will usually see first. You can take advantage of the 120 characters space available to make the title as interesting as possible while still include targeted keywords for the search engine to understand what the video is all about. Overall, the title should be attractive without any keyword stuffing. Following the title, there’s a space beneath the video where you can add a description up to about 700 words. This section is an informative source, especially for the search engine crawlers. Remember, the machine can’t actually watch the video or listen to the words, so they rely heavily on text to understand the entire content. For marketing purposes, it would make sense to have your keywords somewhere in the first 150 characters and a strong click-to-action (CTA), usually a product review page, to your site. This is because the description usually gets cut off after that and viewers often don’t read the entire description as their main purpose on YouTube is to watch videos. 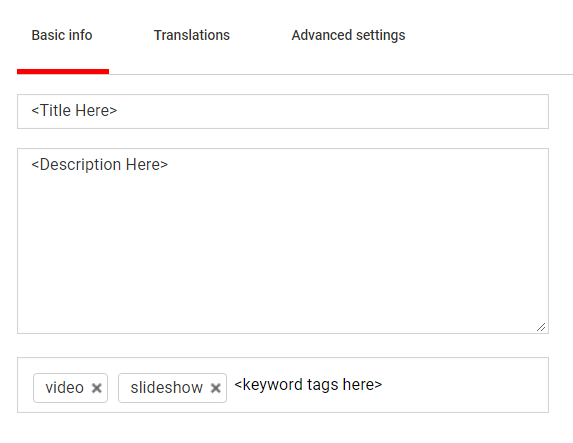 The next step is to add relevant keyword tags that will help YouTube learn more about your video. Even though you can have as many tags as you like, the rule of thumb is usually about 10 tags or so. Try to be specific and use tags that are closely related to the content that you intend to deliver. In case you don’t know, a thumbnail is basically a reduced-size versions of pictures or videos that is often used in social media for recognition and organization purposes. With so many videos flooding the internet, there’s a need to stand out among the crowds, get better click through rates and a good thumbnail can help with that. The file quality should be in JPG, .GIF, .BMP, or .PNG form, has high resolution and comes in the size of 1280 x 720. All YouTube accounts facilitate the creation of thumbnails, but you can also use online designing tools like Canva to come up with something more attractive. Whatever it is, make sure the thumbnails are readable, so that viewers can easily see what it is about at a glance, even when they appear in the right-hand column of the suggested videos. Automatic captioning is a YouTube technology that uses speech recognition to automatically create captions for your videos. This feature is a great way to make content accessible to viewers and also boost your videos in the search rankings. The process is generated by machine learning algorithms, so it may not be perfect, but it’s definitely worth trying. This feature can be found under the ‘Subtitles and CC’ settings and if it’s available, you’ll see Language (Automatic) in the ‘Published’ section to the right side of the video. Reviewing the captions is possible and if there are any parts that haven’t been properly transcribed, you may edit and remove them appropriately. After hitting publish, don’t forget to embed the video on your website/blog with content that supports the media. This can help to initiate some traffic for your video that’s still new on YouTube and also get some social sharing going. 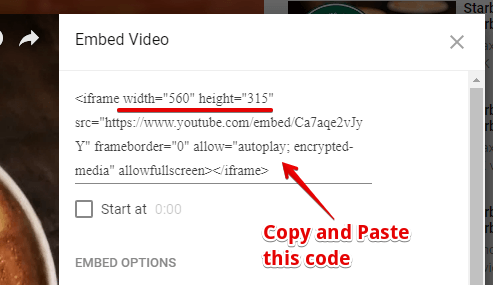 To do so, go to the ‘Share’ button under the video and select ‘Embed’. A pop-up window like this will appear. Copy the iframe code on the right side and paste it in the HTML editor of your WordPress website. You may change the number of width and height in the code to adjust the video fitting within the webpage. 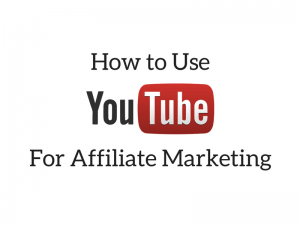 So there you have it – eight simple steps on how to use YouTube for affiliate marketing. The rest of the task now is to create as many good quality videos as you can and constantly link them to your main site to get more traffic for your review page. People tend to go into popular search engines with the hope of getting huge traffic over a short period of time. Often, they would fall prey to paid services that offer ‘YouTube views or traffics’ for their videos. If you’ve seen this type of thing online, don’t be tempted to use it. Firstly, any type of traffic schemes that involve automation are usually short-lived. You’ll get a wave of traffic coming in and then, they quickly disappear. Not only will these links not convert, but they will also signal to Google that you are using tactics to game the ranking system. Consequently. your videos can actually move down the ranking even more and in a worst case scenario, your account will get suspended by YouTube. Search engines don’t tolerate this type of practice anymore because it doesn’t serve any purpose for the users and their machines are getting smarter at differentiating naturally-occurring versus fake traffic. So, stick to the methods that I’ve just shown you and don’t go around spending unnecessarily on things that don’t work for the long term. What’s Your Video Idea Like? By 2019, 80% of global internet consumption will be made of video content so where do you see yourself in this trend? Will you be doing video marketing or not? I sure hope that this article has inspired the YouTuber in you to forge something creative with your online business. Remember, you don’t need to become or hire a professional to get started- just start small, grow from there and I’m sure you’ll find an audience on this platform. Hey, if you are searching for more YouTube resources, feel free to check out some of the video training that are available at Wealthy Affiliate. They are free to watch (for a limited time) so do take full advantage of it. Any questions or thoughts about this topic? Just leave them in the comment below and I’ll be happy to respond. Fantastic well written article. I had heard so much about using your niche in a YouTube video, but was very confused on how to go about it. I stumbled on your article and after reading this well informed article with your step by step guide It’s not as hard as I thought it would be. The video was also great shows you don’t need all kinds of fancy equipment to get it done. Thank you so much for sharing. I am actually not fond of creating videos, probably because I haven’t done a lot of recording and don’t really like the sound of my voice 🙂 As a new affiliate marketer, I could see that ranking for videos is quite similar to that of blog articles. I will certainly look into these steps in detail and create my first YouTube video. Thanks. Yup, a lot of the steps are quite similar – from keyword research to basic SEO settings. Sometimes, I also use keyword suggestions from YouTube search engine to apply for my article writing. It helps to brainstorm more ideas. Thanks for this article. This renewed my interest in creating videos for the purpose of linking to my site and adding traffic. I have a question that hanged here in my mind for months, and I hope I can get a good answer from you, or probably a good advice…. I am a camera-shy person, and instead of shooting videos of me talking in front of camera, I think of other ways like using an article to video converter. It works like you put your text article in the software, and the software automatically reads the text article with the voice being recorded, and visually works like a slide share of beautifully done presentations. What do you think of this? Can you recommend a software that works very well and won’t scam me of my money? Hi there Gomer. Animated video maker could be what you are looking for in this case. There are many online software out there like Moovly, Animaker and Biteable. Each has its own merits, but most have free trials so rest reassured that you won’t be scammed. Hope this helps. I probably use YouTube 1-2 times a day to look up different things – whether it’s a recent movie trailer or how to verticut my front yard. It’s an amazing source of knowledge. I have been working on my own website and have never really considered the power of YouTube, but after reading this article, I am rethinking that. The component about actually making a video is a bit overwhelming, but the payback looks like a very good return. Hey Mat, if you aren’t ready to make videos yet, that’s absolutely find. You can use YouTube as a second search engine to brainstorm keywords for your new site, just like how you would with Google, and if there’s any interesting videos, just embed them on your articles to increase your page view duration. In order to make really good money, you have got to be an enthusiastic YouTuber – not only in the video production section, but also reaching out to new audience constantly through social media and blogging.